This guide will list the places where I found the most [Volatile Earth]. 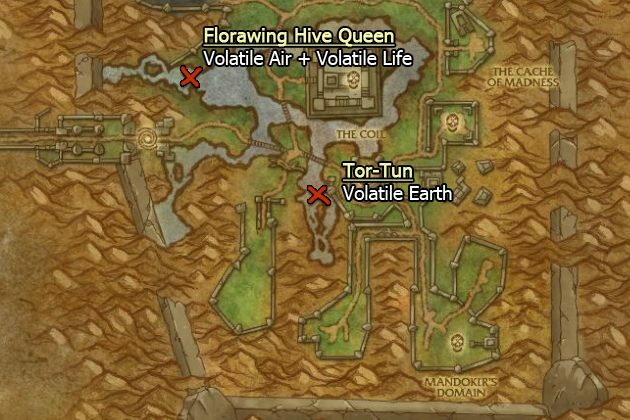 One thing I noticed while farming Volatile Earth is that sometimes you farm for 15 minutes and you don't get a single Volatile, this is just bad luck, don't get discouraged. You can farm Volatile Earth in Twilight Highlands by killing Obsidian Stoneslaves. Do not forget that if you are a miner, you can mine the dead mobs and you will get more Volatile Earth. There is another good place is in Mount Hyjal. Kill Scalding Rock Elementals. These mobs are easy to kill and the respawn rate is pretty fast.